In the city, it takes an average of eight minutes for an ambulance to arrive on scene. In rural areas, it can take up to 25. How long would it take you to get help on your worksite? A person can die from cardiac arrest – when the heart stops beating normally and cannot pump blood effectively – in an instant. In fact, 95 per cent of cardiac arrest victims die before they reach the hospital. But, when care is provided within five to seven minutes, including early treatment with an AED and CPR, survival rates can improve dramatically. Here are my top five reasons why you should consider investing in one for you workplace. Sudden cardiac arrest can happen anywhere and at any time. When the heart stops beating, blood stops circulating. Brain death can begin in as little as three minutes. The chances of survival doubles when immediate action is taken; the use of an AED may increase the likelihood of saving a person’s life by 75 percent or more over CPR alone. It’s important to recognize that everyone is vulnerable to encountering cardiac arrest. Heart disease doesn’t discriminate; it can affect men, women and children of any age or background, and those who work in strenuous environments (i.e., in the outdoors, in extreme hot or cold conditions, or partake in physical labour) are especially susceptible. Every one of your workers could be at risk for cardiac arrest. 1 in 12 (2.4 million) Canadians are diagnosed with heart disease. It is the second leading cause of death across the country. It’s estimated that 35 to 45 thousand Canadians die of sudden cardiac arrest each year. The risk of developing heart disease increases the older you are, and our workforce is aging. 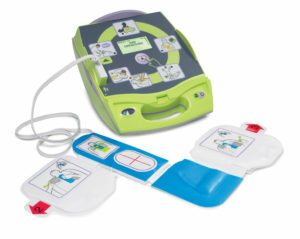 Modern AEDs are compact, lightweight and portable. These battery-operated systems are safe and easy to use. Units such as the Zoll Plus provide visual and audio instructions which guide a user through the entire resuscitation process. The AED automatically analyzes the person’s heart rhythm and advises whether a shock is needed meaning that a shock can never be accidentally delivered. 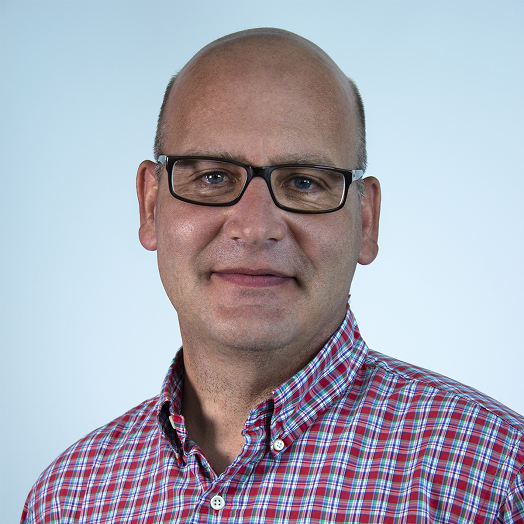 AEDs have a proven track record of helping save lives in the workplace and, with the recent increase in competition amongst suppliers, the price and accessibility of investing in one has never been better. There are options available for every budget ranging from $1500 to $3000 which are based on user preferences and requirements. AEDs have become an expected addition to a safe work environment; they’re a good investment for everyone. Having a unit on site ensures the wellness of your employees, customers and visitors. It’s more than an essential component of your workplace preparedness plan – it’s a tool all workers deserve to have access to. We spend one third of our lives at work. Why not have a first response tool readily available on scene for all your employees? Like insurance, it’s better to be prepared and have nothing happen than face the worst and not be ready. 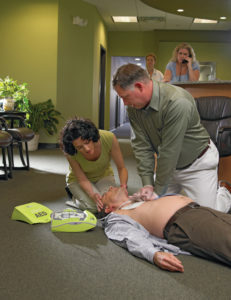 To learn more about our AED products, click here.